The patent and design dispute between Apple and Samsung has continued to yield a treasure trove of information, with the latest revelations shared by AllThingsD revealing each company's United States sales of a number of their mobile devices. 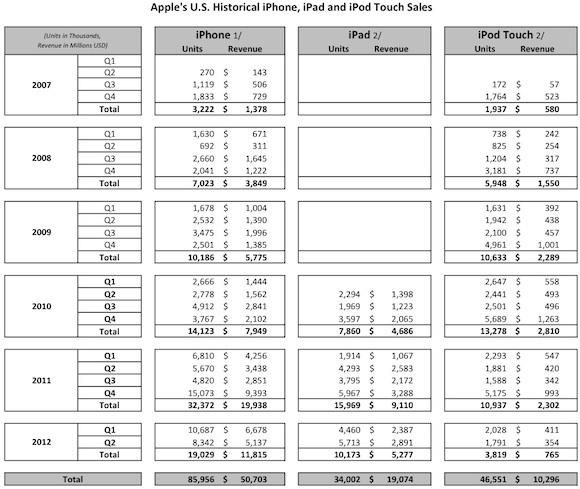 While Apple reports its worldwide iPhone and iPad sales on a quarterly basis, the new document addresses Apple's U.S. sales specifically and includes number for the iPod touch, which Apple has traditionally referred to only generally as representing more than 50% of total iPod sales. Samsung's numbers are also of interest given that the company halted public disclosures of its device sales in mid-2010, citing competitive reasons. Apple's numbers reveal that the company has sold nearly 86 million iPhones in the United States, or roughly a third of the company's total sales of nearly 250 million units worldwide. The data also reveals for the first time that Apple has sold 46.5 million iPod touch units in the U.S., having peaked in 2010 at over 13 million for the year. On the iPad side, Apple's sales of 34 million units in the United States represents approximately 40% of the company's total iPad sales of 84 million units worldwide. Samsung's numbers include only those devices that are included in the lawsuit and thus omit a number of recent popular smartphones, as well as several tablet models, but they do reveal some interesting information on Samsung's sales patterns. Perhaps most interesting are Samsung's tablet sales numbers, which include a total of just 1.4 million units sold through the second quarter of 2012 for the three devices included in the lawsuit: the original Galaxy Tab, the Galaxy Tab 10.1, and the Galaxy Tab 10.1 LTE. This is compared to a total of 34 million iPads sold in the United States since its original launch back in 2010. On the smartphone side, Samsung's filing offers a complex picture of sales of two dozen models, although a number of them are simply carrier-specific versions of the same device. All told, the Samsung sold over 21 million of the smartphones included in the lawsuit, representing $7.5 billion in revenue. Documents filed by Samsung lawyers on Thursday reveal that, from June 2010 through June 2012, Samsung sold 21.25 million phones, generating $7.5 billion in revenue. On the tablet side, the company sold 1.4 million Galaxy Tab and Galaxy Tab 10.1 devices, producing $644 million in revenue. In terms of individual phone models, the largest in units were the Galaxy Prevail with 2.25 million phones sold, the Epic 4G with 1.89 million phones sold and the Epic 4G Touch variant of the Galaxy S II, which sold 1.67 million units in the U.S. All told, Samsung sold 4.1 million Galaxy S II devices, when all models are included. The report notes that these sales numbers are just some of the key internal data that both Samsung and Apple have been fighting to keep private but which have been brought into the open as part of the ongoing dispute. Overall, the trial has yielded quite a bit of interesting information on the both Apple's and Samung's mobile businesses, including some insight into Apple's early development of the iPhone and iPad. The numbers seem way below previous statements. What happened to 250 million iPhone? I wonder if there is a clue in the article title? Steve jobs would have never allowed confidential sales numbers to leak out to the public. According to Samsung's sales numbers, the best-selling smartphone they list is the Galaxy Prevail, a cheap prepaid Android 2.2 phone. I feel like Samsung's huge gain in market share lately is in part due to the fact that even prepaid phones are now considered smartphones since they run Android. "Dumbphones" are getting rare, it's cheaper for manufacturers to just put Android for free than maintain their own dumbphone OS. The sales figures are just for the United States. Just In: Huawei more popular than Samsung.